During our 3 p.m. trip we found Pinball deep feeding up north. She gave us some great looks right alongside the boat. We also saw a bit more bird activity including Wilson’s storm petrels and a few sooty and great shearwaters! Look closely at Pinball’s dorsal fin. If you look closely at her left flank you’ll see a pink spot. That spot is actually a parasitic crustacean known as a cyamid, or whale louse. They crawl and attach to the whale’s body and feed on algae. Generally they may cause minor irritation to the whale, but the whales are quite used to these critters! The 10 a.m. trip on the Asteria had to turn back due to increasing fog and rough sea-state before we could see any whales. 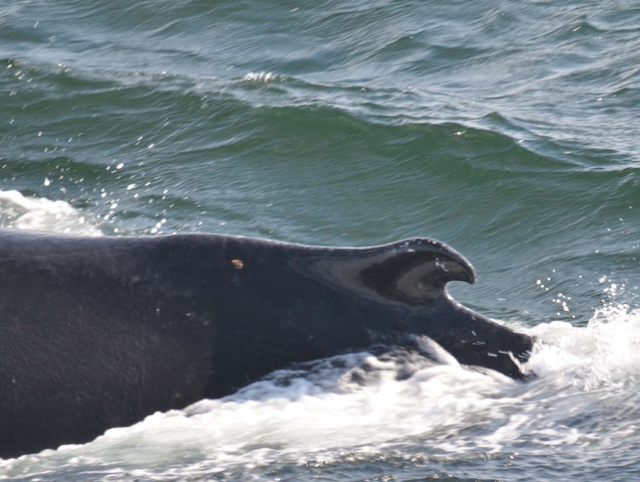 But all passengers were issued rainchecks to try again on another New England Aquarium Whale Watch this summer!